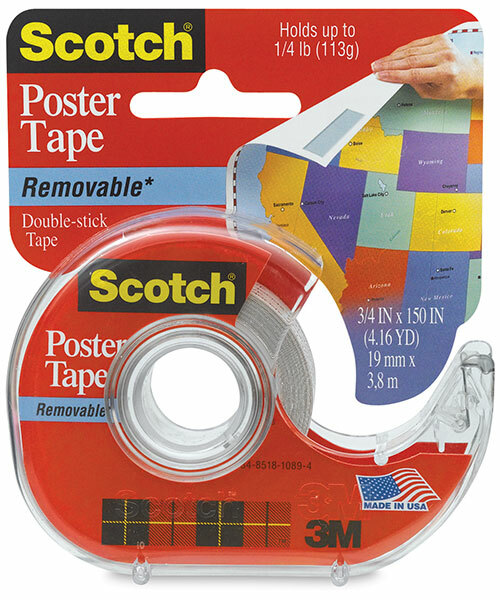 Scotch Removable Poster Tape is a unique double-coated mounting tape that securely mounts posters and lightweight objects on wood walls or doors, tile, glass, refrigerators, vinyl wallpaper, and primed and painted walls. Sticky on both sides, it won't damage painted walls and holds items up to ¼ lb. It removes cleanly, but the poster or object being posted may be damaged upon removal. Scotch Poster Tape is not recommended for use on wallpaper, delicate surfaces, or walls painted with flat paint.